Well, we're not going to lie to you: it's not good news when a leprechaun has to carry you home at the end of the night. It means you've out-partied the party master, himself. But, on the other hand...it does make for a pretty hilarious costume! 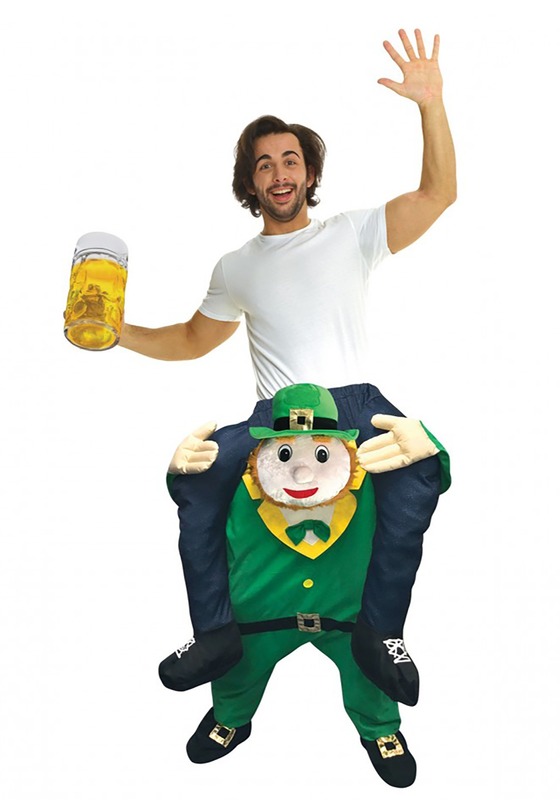 Whether you sport this Leprechaun Piggyback Adult Costume for Halloween, St. Patty's Day, or a typical Tuesday at the pub, you'll be the hit of the bash wherever you go. Because let's face it—anyone can wear a "Kiss Me, I'm Irish" T-shirt, green glasses, and green beads to "celebrate" St. Patrick's Day with green eggs and ham, green beer, and green who-knows-what-else (and many, many do). But it takes a true believer to bring their own leprechaun to the festivities! So, what'll it be, champ? Do you want to fade away into a sea of green this holiday? Or will you take a ride on this little sprite and test the luck of the Irish? This clever costume will have your pals cracking up when you show up for the pub crawl and will keep everyone in high spirits all night long (as though that's hard to do on St. Patty's Day!). Here's what you do: You slide your legs into the legs of this little leprechaun, and stuff the "human" legs that dangle from his shoulders with newspaper to fill them out. You then pull the costume on like pants and secure the drawstring and—voila!—you're getting a piggyback ride from a leprechaun! Cool, huh? Mug of beer not included, but...we trust you can muster one up if need be. Everyone will be grinning ear to ear when you arrive for the party this year! Just, don't rely on this little fella to be your designated driver for the night. Leprechauns are notoriously bad at the rules of the road. He's happy to give you a lift home, on his back, though. Have fun!